He must fight for his 5'9. Maybe he is in shoes, like I'm 6'0.5 in shoes while barefoot 5'11 and I claim "I'm 6'0 footter". Way to go mr.Cruise! Agree to disagree - She had less than an inch on him in the barefoot pic IMO. But I think then there is a good case of Katie Holmes being 5'8.5"(174cm) than 5'9" as listed considering her claiming 5'9" and 5'8" on various occasions. I am not just saying this just because to support my theory of Tom at 5'7.5" , its bcz I've seen several supporting proofs for putting Katie at 5'8.5". But in the end its like you said: its all about the opinions. But I think then there is a good case of Katie Holmes being 5'8.5"(174cm) than 5'9" considering her claiming 5'9" and 5'8" on various occasions. I am not just saying this not cuz to support my theory of Tom at 5'7.5" , its bcz I've seen several supporting for putting Katie at 5'8.5". But in the end its like you said: its all about the opinions. ok - Its all about opinions. However, if you have seen the barefoot pic of Tom with Katie Holmes that has been posted on here a number of times, Katie cannot be more than 5'8.5 if you think Tom is 5'7.5, and not the 5'9 Rob has her listed at. Anything higher seems generous, but going lower seems unrealistic. Maybe you have a point.Still, Cruise having extra footwear in some way is very likely and it sure is. Also take into account that Big Jay also confirmed Tom is max.Jay's height i.e. 5'7.75" tops.But if Cruise is 5'7.75" as listed above, he is aint far off from 5'7". And honestly 5'7.5" is much better fit for Cruise. Even 171 cm is arguable. 5'8" is far fetched by a long shot, at least for me. Robert Downey Jr. And Tom Cruise are both surely under 5'8"(at least by 0.25") mark for sure even in their prime, IMHO. I always felt Cruise had a solid inch on 5'7 listed Michael Pena. If you google Pena with Danny Trejo a flat 5'7 for Pena looks right, and the Pena page seems to confirm it. The tallest 170cm man I've ever seen. While with those pics you definitely have a point, do you think Cruise being like 0.75" taller than 5'7", would be much of a difference even in those photos? After all, Tom Cruise is surely only like 0.75"max taller than 5'7" anyway as listed above. I still believe Cruise at 5'7.5". Maybe a quarter more is a possibility. Exactly , not everything is racism. I personally think everybody is equally scum ;). Hey Rob, how many inches difference do you see here? Height aside, this has to be the best picture ever taken of a man. He was always very good looking and his charisma made him the star he is. I'd take Tom Cruise's height(which isn't even bad, he was probably 30-40 percentile in the 80s) if I had his face. it will be interesting to see how Tom's career goes over next 10 years. Many actors can continue action-thriller roles well into their 60's these days and make it believable, Tom still has the benefit of looking at least 5 years younger than he really is. I agree, people nowadays overuse and misuse the word "racist" too much. It's not like you were saying that white guys are taller because they're superior compared to other races or anything. There's plenty of racism on the internet and IRL these days. The comment from HonestSlovene on Dec. 26 wasn't remotely part of it. As 6footTom explained, HS was only speaking on behalf of the demographic Cruise happens to be a member of....so it makes perfect sense. Are the consensus studies of varying average heights among different races also racist? It's one of the many methods of presenting how above, below or otherwise close to average height any given person may be, by putting things into perspective via the usage of numerous variables. Nothing more it it than that - merely apples and oranges. @randomouser This racist stuff is low IQ and getting tiring. How old are you, 12? @6footTom I agree 100% of course compared to the general us average, which is 5'9"-5'9.5" range he is more shortish, but still on the shorter side. No. Thats 100% impossible with all the prevailing evidences unless Tom has some high tech hidden 5 inch lifts LOL. Even with all the room for doubt, I would give Tom Cruise min 5'7" and Max 5'7.5". Imo, Likely right on 171cm. Tom Cruise is a white male, so I don't think it's necessarily racist to compare his height to the white average in the West and I'm speaking as an Asian minority living in America. @Bobby He's 5'7" on IMDB and honestly that closer to the truth. Also he isn't a midget but he's still short, 5'7" is short and 1 SD under the 5'10.25" young non shrinking white male average in the west. Only a racist would exclude minorities when determining the average height. The REAL average is 5'9. Get over it. Wow, almost 500 votes... and Tom's clocking in at 5'7 1/4". Lots of people say Tom has a diminutive height but he looks average in movies. Even Family Guy has made fun of his stature, but for a weak 5'8 guy, he doesn't look short. I don't know what his IMDB resume would say, but a figure of 5'8 would be honest for him. His stocky build makes him look shorter though. Editor Rob: Oh, Hi Bugs, I mean Tom! Editor Rob: some people they certainly will try to measure. I'm sure Tom was one of those who agreed. Cruise is now 55 years old, I'm pretty sure he has lost quite a bit of height by now. My current guess is somewhere between 170cm-171cm. Give it 5-10 years and he'll dip below 170cm, no doubt. With the right camera angles anybody can be an action star at any height...even the G-Man. It just goes to show u don't have to be a 6.4 man in height to be in action films. The funny thing is is that there's plenty of actors that are the same height or shorter than him that don't even get a fraction of the flack for their small stature that he does. I honestly think it's just a combination of things that result in Tom's case. He's a handsome, leading man, action-type star that people expect to be taller than 5'7"/5'8". This has resulted in people having a perception that he's much shorter than he really is. Sincerely, Tom Cruise is too insecure with his height, it's ridiculous he's not even really short (under 5'7) ... I think he's 5'7-5 '7.25 no more. 5'7" was his peak height. Editor Rob: small shoulders and a giant wallet. He was exactly 5'7" at his peak. To Adam: Lovitz..."Yea dats right, 5-10". Tom is anywhere between 5'9.5" to 5'10"
In the above pic if katie holmes will be without high heels then tom would be 1" taller than her.This proves that tom is 5'10". Tom has everywhere claimed that he is 5'10" tall.Both Justin bieber and tom cruise have same height. tom cruise is 5'10" without shoes as claimed by him. Doesn't appear short in person at a weak 5-8 and good posture. He's pretty short. Looks like a little boy next to Katie Holmes in the pic at top! Gonna say 5'7", give or take a fraction. That's if he's not wearing lifts. @James B Either you are taller than you think, or you are a poor judge of height. Gaffney is actually taller than 5'5", go to his page; as Parker pointed out, he downgraded himself. Tom Cruise have been barefoot in public so many times, no problem. He wears lifts and elevators, true, like everyone else BUT he doesn’t have height complex as Brad Pitt who we will never see barefoot besides anyone, not even on the beach. Any male actor who's below 6ft lies about their height. Dean Gaffney (Eastenders) says he's 5ft 5 and he's maybe 5ft 4 on a good day. I met him in 2001 at the age of 20. I'm just over 5ft 8 and was at least 4 inches taller. Ryan Thomas (Coronation Street) says he's 5ft 9 but he's good inch shorter than me. I also met him in 2001. Cruise appears 5ft 9 at times but there's no doubt he'll be wearing lifts of some description. It's not difficult. My former boss and CEO who was just under 5ft 7 would routinely wear lifts making him 5ft 10 when going on client/business development visits. I think if he was really 5'7.75 he would not be so complex ... 5'7 and nothing more, 5'7.25 at the most. Editor Rob: I think it's a cumulative scenario. The more people see mention of his height or lack of or articles bringing up 'short' all the time, he 'has to be 5ft 6', everyone is saying it! A number of my workmates think he is 5'3. Editor Rob: they'd be in for a shock if they ever met him! 5"7' isn't really very short= it's only about a forehead shorter than a real 5"11' guy;and a little less than a forehead when the 5"11' guy wear flat shoes and the 5"7' guy wear comfortable classic heels;and there is not good heights and bad heights=tall women or men have some advantages and small men or women have others advantages. I think he is short... 5'7". He is 172 cm, now that he is getting old he may gradually lose height but he still measures 171.2cm, I do not understand people who say that he is under 170cm that is impossible, it must be bad enough to calculate the stature as to assure that, watch him dezcalso in top gun next to Anthony (188cm), barefoot next to Katie Holmes175cm or in photos of the 90s with his ex-wife Kidaman (179cm) and he did not wear shoes to increase his height see it well I'm not a fan of Tom but the reality is that he is not short, when he really wears shoes to be taller he remains like 5 "10 NEVER looks less than 5" 7.5 so Rob has it at 172cm and on this site he tries to always say truth, the stature of this man is not a mystery. Well, I respect the opinion of others, but I have seen evidence and I am sure. Tom Cruise looks at time 5ft10 because he use elevator shoes all time, but is clear, he's no more than 5ft7.25 mark. 5'6.5 for Crouise, 5'8.5 with lifts. Tom Cruise is not even 5'7". Editor Rob: Tom does not wear such a cheap make as chamiripa...now he might be wearing a customs dons Quiri midsole tech, I'm not saying he is, but he might have a special discount code too! Wow, I can't believe Americans are so tall and heightist that they constantly mock an almost 5'8 man for his height. Here in France 5'7.75 is spot on average. I'm glad I don't live in such a giant country like America. Apparently the average white man is 5'10.5 in America, which is almost the same as the Dutch. He looks like a flat 5ft 8 with clever footwear. Tom cruise is 5'10".See his pictures with 6'1.5" nicole kidman. Editor Rob: I think Tom at times can look a comfortable 5ft 11...here with Noah Taylor, considering Noah officially says he's 5ft 10...Tom has to be 5ft 11 range. *According to imdb and google. But why would limit to white males? The US is only 62% white. @Parker: I've not gotten a chance yet, but I'll be sure to pay attention to heights when I do. As for DiCaprio, Tom looks like he'd reach about 177 cm in what I'd guess are 2" elevator shoes if Leo is 6' in shoes, though this doesn't consider Leo's looser posture. Leo did look a weak 5'11" to me in a video with Obama last year, but he can look a stronger 5'11" at other times so I think 5'11" or Rob's 5'11.25" listing is fair meaning the 6' in shoes is likely conservative enough to even allow for Leo's looser posture to some extent. But look at Tom with Robin Williams. Now Robin is what a 5'7" max man actually looks like. In fact, that only makes me believe more that Robin could have been 5'6.5" in his prime and Cruise at least 5'7.5" as it's difficult for me to imagine there being less than an inch between those two. Parker said on 22/Oct/17 ="DiCaprio will be standing at a min 6 ft"
Johnny Depp also a noticeable a lift wearer in hollywood, they input extra thick soles. But the question is how much their elevator shoes gives stay a myth. To me i see 5'7 for Tom Cruise as his peak height and agree 5'6.75" now as you thought too. He looks 5'8.5 next to 5'9 Johnny Deep with a noticiable advantaje shoe. I would guess a legit 5'6.75" for Crouise. That first picture only shows my point, thanks Parker. If Di Caprio who is a solid 5'11" with bad posture still looking almost two inches above Cruise with lifts (who have a perfect posture in the picture) just show Crouise like 5'6.5 without his lifts. Why he gets labaled as short while only being 1-2 inches below average? we live in a superficial world.. I saw it, and he is 5'6.5" max. Looks his lifts god, and he is no more than 5'8.25 with them. Cruise is standing close to 5'10 in those lifts, which means its impossible for him to be under 5'7 IMO. He looks 172 next to AL Pacino, Dustin Hoffman, Jamie Foxx, David Beckham and Steven Spielberg. But he looks a little taller next to other people for somme reason. The Park is correct but lean to 5-8. Yes I agree - By the way have you seen the new Jack Reacher film? He really does pull off looking a 5'9 guy in it. He is 5-8 in posture, I saw it. Needs the full 5'8" upgrade. Well i think he needs be downgrade to 5'7"
@Parker: That's true, but I think the two are a bit far away in that photo to judge precisely. For an example of what I'm saying, look 5'10" Billy Bob Thornton, who looks 2" taller than Cruise as well. Granted, Billy Bob likes bigger footwear much like Cruise does, but I'd have to see from other photos if he was wearing height-enhancing shoes that particular day. I do think the photo is tilted a bit from left to right, along with a bit of a low angle, though that means Bruckheimer would get an advantage over Cruise so Cruise pulls off nearer 5'9" than 5'8" if Rob's listing is accurate for Bruckheimer and I don't think he can be far wrong on Bruckheimer based on the fact he looks no shorter than 172 listed Ben Kingsley there. @Parker: Look at the size of those boots though! He's around 5'9-10 there compared to 6' Nicholas Cage. He's probably about 5'7 barefoot. @Jeremy Pivin Ben Stiller ain't 5'8" though. Standing ~ 2inches shorter than Jake Gyllenhaal with a little extra footwear. 5'7.5-5'8. Rob's listing is spot on. it's pretty straightforward, he's half an inch taller than 5'8" Ben Stiller so Tom easily hits 5'8.5" barefoot in Tom Sooo Tahl & Manly Nail Seyo. In Korea, height is an obsession, specially in the younger generation. Short guys are openly ostracized and bodyshamed. Yet they absolutely Loooooove TC. If he really were as short as some here claim, they'd be making fun of him 24/7, instead of naming beauty parlor after him. 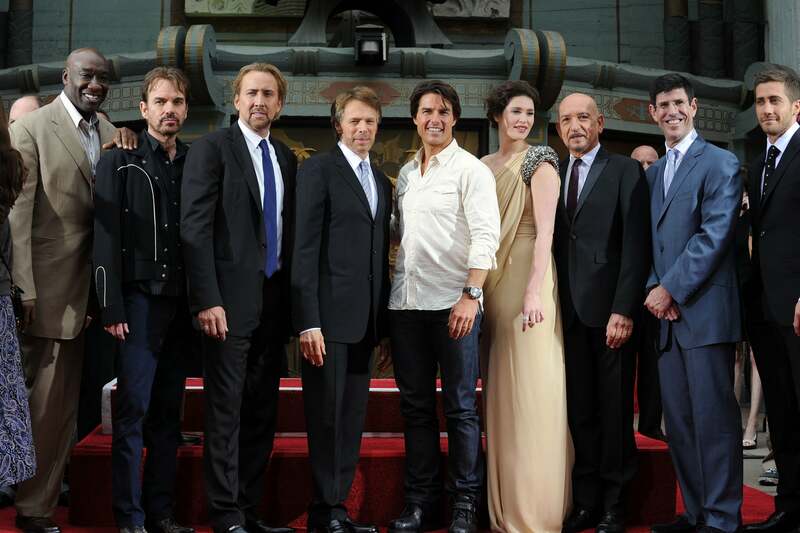 At Bruckheimer's ceremony, he looked at least 3 cm taller to me, but not more than 1.5" taller. If he is 171 cm then Cruise passes for a 174 c m man, maybe a weak 5'9". I do have to wonder how he'd look next to Bruckheimer without lifts, especially after seeing this photo on the set of Days of Thunder: Click Here My guess is they'd be very, very close. Much like Cruise with Spielberg. The one thing that makes Tom's lifts very obvious in these photos is the jeans he wears with them. A longer boot cut jean a bit looser would conceal them much better. Lately, he seems to prefer more of a 2" elevator shoe. interest in the film, Kelly McGillis. stocking feet,” Kelly told NewsOK. special cowboy boots that gave him a little height boost. HonestSlovene, I've come to the conclusion(correct me if wrong) that 5'9", 5'10" and 5'11" are all average for a Caucasian man. So yeah 175-181 is average in the west, 182,183 and 184(6') is the start of tall. First of all nobody claims height in shoes.If tom has claimed 5'10" then he has to be 5'10" simple.He knows his height not anyone else.See his above photo with Cameron dias in 4.5" heels...she is 5'9" and tom is not standing straight...cameron would be 6"2" and tom 5'10"...very simple to judge. LOL would love to see his 5'10 barefoot claim. He is on the shorter side, now he of course isn't shockingly short, but since he wears lifts to premieres 24/7 and constantly play macho characters in his movies it's only logical people would make fun of his napoleon complex. I'd say 5'7"-5'8" range is fine, 2 inches below average in the US. I think 5'7.5" to 5'8" is more likely for Cruise than 5'7" is. He's at a mere average height, so I really don't get the whole "Cruise is shockingly short" thing...he never gave a particularly tall impression to me in the first place, or a short impression either. I'd say Rob's 172 cm listing is reasonable. Thanks, Rob. I've made that point consistently. The press just decided Cruise was 5'7" and it got repeated enough that I've even seen it written in papers "Cruise is officially 5 feet 7" which will make many think he's even shorter. On the subject of Tom's actual height, watching Mission Impossible 4 Ghost Protocol a while back, I noticed Simon Pegg was taller by perhaps an inch, but no more while Jeremy Renner looked like he was a bit taller than Cruise as well. So I guess the relatively short co-stars made it so they didn't need to go to great lengths to make Cruise look taller. Though I'm sure he must have used lifts to measure up fairly to Paula Patton in heels as you can see here at least, they weren't using boards in this shot: Click Here Even the heel looks pretty decent. As for Tom's height, I do think he can actually look as tall as 5'8.5", even 5'9" at times meaning he'd measure about 177 cm in his biggest footwear, but if he's wearing 2.3" elevators at times then that puts him back around the 5'7.5" barefoot I've long guessed most probable. He'd probably hit about 5'8.5"-5'8.75" in normal shoes if I'm right. @adam: Provide a link to this supposed claim or at least give us the time period this alleged Time Magazine interview was done. But even if he did claim 5'10", that doesn't mean he is. It's difficult for me to believe you're not trolling unless you've never heard of a lie? I'm pretty sure the only time Cruise said he was 5'10" was in character in All The Right Moves. If he's deviated from 5'9" then I'd be less surprised if he said 5'8" considering how frequently he was described that height along with 5'9" in the 80's and 90's. Editor Rob: generally in the 80's he was called 5ft 9 or 8, I think a fair few mentions of both, but a few 5ft 7's creeped in and over time it has been the most common figure. at times he pulled off looking 5ft 9 to people I'm sure. 5'6'75 could be good for him, 5'8.5" with his regular boots with a inch more. I still remember his interview with the time mag. where he said he is 5'10" without shoes.So he has to be 5'10". Editor Rob: Tom Cruise officially claims 5 feet 9 inches and a consistent 147 pounds through the 80's. I personally think he would measure 5'9 in standard footwear, so it wouldn't have been a lie would it? Editor Rob: if you are 'called out' by someone, you can always use the old 'oh, I meant 5ft 9 in shoes' line to save grace! no actor should be afraid to state their real barefoot height on their resume...you never know, that honesty may pay off. 1.68 without shoes, 1.72 with his regular boots. 5'10" is the correct height for this man...he everywhere claims it...when he has himself claimed he is 5'10" then we will have to agree with him. Editor Rob: Tom may have lost a very small amount, that isn't really noticeable, like 1/8th or so. Cruise himself claims 5'7" officially elsewhere, so it's amusing that anyone keeps on arguing for him to be taller than that. Seriously... you can even Google 'Tom Cruise', and look at the sidebar on the right: 5'7". And that's not even citing certain obvious sources that you're not supposed to mention here on CH. Editor Rob: sorry, but telling people that imdb trivia sections are 'official' is wrong, when anybody can try to alter those heights. you can go to google and imdb and see joe absolom was listed at 5ft 7 (I'm sure it will be changed). Go to Steve Punt's page on here. He officially claims 5ft 9, he is on imdb at 6 foot, again 100% unofficial. Please don't try to pretend imdb trivia is official, when it's 100% unofficial. Cruise Officially claimed 147 pounds and 5ft 9 in 1988, I've mentioned it at the top for years. What I have seen, the best proof of Cruise's height is Big Jay saying Tom is max his height, which means max 171-172 cm. So I think that rules out the possibility of 5'8 / 173 cm. I also think we have to admit that Tom knows how to look taller. For example, take a look at the picture with Leonardo Dicaprio: Tom is using some extra in his shoes and standing totally straight. Leonardo is not so concentrated on his height, he might be standing few cm under his max height. Most of us think Tom is between 170-173 cm. But when comparing Tom with other movie stars we have remember that it's quite easy to look 5 cm taller and usually people are not so obsessed with their height and might even look few cm shorter they really are. So based on what I have seen, my guess is that Tom reaches 171 cm in morning, drops to 170 cm during the day and a bit under 170 in the night. I agree with 170cm barefoot. 175cm with boots and insert lift while filming. He looks compact. Probably a 30" inseam. c'mon guys, he's average! Tom being short is just a myth that started when he was shown next to Iceman, Slider & mother Goose. If you carefully watch him in Oblivion, he holds up pretty well next to Morgan Freeman and he towers over his female co-stars! Big Jay in my memory was writing he was looking max his height.Big Jay is 171/172 range in my memory.It was an event.The question is =what is the probability he was wearing little lifts this day=big probability imo(not very important if he's under or over 5"7' because he's very charismatic). Interesting, Rob. I guessed the boots Tom was wearing to the Knight and Day Tokyo premiere and Jerry Bruckheimer's Walk of Fame ceremony to be 2.3" range, but I agree, Tom usually looks to wear more 1.8"-2" elevator shoes. Hey Rob, only the midsole itself gives 2.5 inches or the overall shoe? Editor Rob: the overall shoe might give slightly less, but it could still be 2.3-2.4 range (ones sold as 2.5 inch). Rob, how much height could 2.5 inches elevator shoe give from dons footwear? Editor Rob: if they are using the 'midsole tech' then closer to 2.5 than 2 inch. 2.5 is a huge height in any case for a shoe, if I wear one of the older Dons which were billed I believe 2.75 (and gave 2.3ish inches) people notice the difference. 1/2 or 3/4 increases aren't going to be picked upon, but over an inch gain (over your normal 1 inch shoe) means many will pick up on it. Tom in last 5 years has on a couple of occasions looked to wear a 2.3 elevator, but a lot of time I don't think he is in anything obvious. I think he is between 171 cm -173cm. 172 cm maybe. I am not kidding its very easy to lose height even if you are only middle aged. Only if you are afflicted with a degenerative spinal condition or have been involved in a serious accident - neither of which there has been any evidence of when it comes to Tom. According to CDC data, the average 20-39 year old white man is the EXACT same height as the average 40-59 year old white man (5'10.1). People generally do not lose much height until they are in their sixties or beyond unless they have back/leg surgeries. Your brother is definitely an outlier. You don't lose 2.5" in 2 years at any age without some horrific injury and major surgery, much less in your 30s. You didn't measure him correctly otherwise, or he had goth boots on the first time. I think he might have been close to 5 ft 9 when he was younger and shrunk down to 5 ft 6 or 7 as he got older, people forget he is becoming a old man and peoples spines compress as they age. That is absolutely ridiculous...he's 55, not 95. He almost certainly hasn't shrunk at all - and only a negligible amount, if anything. He's always taken very good care of himself and remained quite physically fit. for instance my brother who I know for a fact was 5 ft 9 and a half as I measured him personally is now only a couple of years later just over 5 ft 7 and he is only in his 30s. some people lose more height as they age than others, you could be right that Tom may have always been his current height of 5 ft 7 but the possibility that he may have been taller isn't completely ruled out and we probably would never know for sure since hollywood is full of trickery like heels, lifts and modified sets. @Rising: why do you feel the need to insult me by saying that I need to work on my reading comprehension? I'm not insulting you at all or even picking on you. I only point out the facts. But like you said my comments came off to you a certain way that it hurt your feelings, that's your issue since I didn't intend to be rude or obnoxious, so again don't read posts like they are somehow an attack on you. I read your long post and didn't wanna go too much into analyzing your judgement especially the part where you don't take hair into consideration, you must be joking then? Actors have been using hairstyles to give themselves extra advantage. And I'm not sure if you work on film or with film, angles do tricks that will change complete perception. Top actors even have firm of publicists that handpick the photos and even their own teams take the photos to make sure their clients look the best. You need to realize that every person writes differently, some write fast and short, and some, like yourself write long essays. I'm glad that you have lot of free time to type for hours, but unfortunately I don't have your luxury. You know, I have noticed that you constantly pick arguments with other posters by construing their comments and then trying to act like you were the victim and somehow people need to apologize. I would expect that since you have lot of time to do research and write essays, then at least get the facts correct because otherwise when you post a photo like the one with Cruise and Newman and don't mention the facts, instead you say Cruise looks taller, then you lose credibility. Lol. He's 55, not 85. @GP: The height part is lighthearted, but not being spoken to in a condescending manner. That will annoy almost anyone and subvert the lighthearted tone in general. And it does appear you need to work on reading comprehension because like I said, this is not the first time you've read only a portion and made an assumption that could be shown to be erroneous by accompanying words or sentences. The rest of your comment is completely irrelevant because I acknowledged I erred in considering the conditions of the scene I posted a still from because I didn't catch Newman leaning against the shelf before. That's not the issue here. I can't speak for your intention, but I can say how that post came off to me and I don't think my interpretation was unreasonable. @Rising, its funny that you are telling me to work on my reading comprehension and alleging that I was typing the message with an obnoxious and insolent manner. You should follow your own advice and don't read too much into it. You're applying too much emotion to this, since you should know that's pretty silly being here for 10 years. As you said, it's supposed to be light-hearted. And we are not trying to solve complicated formulas, it's just discussing other people's heights. This is why I barely post anything nowadays. Everyone wants to be right, I guess that was always the case, ha!! @GP: First of all, I have watched the film, which is why I brought it up and should have been obvious based on all the details I knew such as Cruise's Cuban heels - which on another glance, look the same size as my 2" Cubans - as well as Newman's shoes, which I also mentioned were shown to be normal when he's lying on the bed in the hotel, the fact I mentioned that after those first couple of scenes, Newman seemed taller most of the rest of the film and I mentioned Cruise didn't seem that much taller than Mary Elizabeth Mastrantonio. I didn't think of the leaning as it's easy enough to see before Cruise walks over and shakes Newman's hand, but from the angle where they're face to face, it's tough to tell, especially if you didn't take cognizance of that fact before Cruise approached Newman so I actually appreciate that information, but certainly not the obnoxious, insolent way you said it. As I said, it was a mystery to me why he looked that tall, but now finding the scene online to rewatch, I can see more of their heights when Newman moves around a bit and I can see the camera angle was advantageous to Cruise. In fact, looking at those early scenes again right now, I see Newman leaning on another occasion when they're packing as well as another angle that favors Cruise. They shoot it in a way that makes Cruise seem as tall the first 45 minutes or so, but even if you can tell the early scenes are the result of clever camera angles when watching closely, Cruise can still look closer than he should to Newman's height at times. I never include someone's hair in my judgement, but considering 2" Cubans will add maybe 1.75" in actual height, Cruise's footwear as far as we know will only give him about a 2 cm advantage over Newman unless Cruise had an extra lift inside. Though in other scenes, he does look noticeably shorter. This isn't the first time you've done this sort of thing so why don't you work on your reading comprehension? More helpful advice would be to remember the light-hearted tone this site is meant to have and maintain. As for Cruise, I haven't even been arguing he's as tall as 172 cm. I believe he's most likely 5'7.5" seeing him with men in the 5'7.25"-5'7.5" range like Spielberg, Bruckheimer and Lewis Hamilton, perhaps even 171 cm if that's how tall Hamilton is. He does sometimes give a genuinely taller impression, though so I can see why Rob has him 172 cm, but like I said, my guess has been consistently 5'7.5" for a while. I personally don't see much chance of a 5'7" flat Cruise, but that's just me. As for Newman, I've thought for a while he was more 5'9" than 5'10", especially seeing him about Spielberg's height at age 77 when Road to Perdition was released and then 5'7" at best by age 80, maybe even 169-170 range by the end of his life. But I'm open to Rob's 5'9.5" listing seeing him look so close to Redford and Robert Shaw in The Sting(who I think are both about 5'10" or 177-178 cm) and at least as tall as McQueen in The Towering Inferno(who I'm convinced was 5'9.5" barefoot). Plus, I believe Newman claimed 5'10.5" to an interviewer in 1986 so that could have been a shoe height, which implies either 5'9.25" or 5'9.5". So I can see a good chance of anything from 5'9" to 5'9.5" as I think the older actors can be tougher to nail down since we're more dependent on films. Though considering how much Newman must have shrunk in his 70s and 80s, I wouldn't be the least bit surprised if he had lost a fraction by age 60. Rob an American friend of mine back in 2004 or 2005 said to me he saw Tom cruise at supermarket in LA and commented he was really short like around my height and I was only 5'6-5'7 back then. I think even 5ft10 is underselling him. I doubt he ever drops under 179-179.5cm at his low and 180cm is still a reasonable guess. Is this some sort of non-sequitur joke? Tom could possibly be a legit 5'8"(173), but almost certainly no more than that. 172 is extremely reasonable- and in fact most likely- which is why Rob lists him as such, and has so for more than a decade. Rampage is defending brad Pitts listing, a visitor(troll) says brad is 172. Rising, you clearly haven't watched the Color of Money? That photo of them two in the market, Newman leans on the shelf, Cruise is wearing 2" cubans, has puffed up hair, camera is closer to him. I would suggest you watch the movie. Newman was most likely about 5'9", wore pretty thin heeled shoes and didn't have a good posture. Tom constantly looked about 1.5"-2" shorter in the scenes when he doesn't have the advantage of the camera. 172cm or almost 5'8" person should not look about 2" shorter than a 175cm/5'9" person since he has shoe, hair and posture advantage. How did he pull that taller than Newman shot by the toys? Pitt is 172 175cm max tall (barefoot). he seems taller than these measurements because of his particular shape: wide shoulders and thin muscular frame. You know, reading this, there is only one hope I need to cling on to, it is that you are joking. Yes he's sometimes seen in heels but in fairness, he stills appears taller than average even when bulked up massively, and quite aesthetically in Troy. A 5 ft 8 Pitt would have just looked square with all that added jazz, instead he looked absolutely statuesque/semi-godly. He completely looked the part and slipped effortleslly into the role like it was a bespoke fit. Something a 5'8ish actor, like Cruise for instance, would have found more of a challenge. Pitt cannot be under 5'10. That is, beyond the shadows of the wildest possible doubt, his absolute lowest height. When you claim Pitt is 170-175, it's just absurd to my eyes. and it pains me to say, a manifestation of what I can only construe to be envy. He is a legit 171 cm(5'7.25") guy. Maybe give or take a quarter. I was surprised Cruise in Cuban heels pulled off close to a 60-61 year old Paul Newman in The Color of Money. In fact, in a couple of early scenes, Cruise even looked a bit taller, such as the scene this still was taken from: Click Here Although neither are wide shots and Newman then looked taller to me for the rest of the movie and you can see at one point on the bed in the hotel that he has normal shoes not more than 1"-1.25" range and at times, Cruise really didn't look that much taller than 5'5" Mary Elizabeth Mastrantonio, who had probably 3" type heels. But in general, I'd say it's another film Cruise looks more average than short in. His body proportions look like that of a 5'6 stature. His shoes look ridiculous, you can clearly tell he wears huge elevator shoes that add him about 4 inches. 5'6 1/2 at most, he doesn't appear to look close to 5'8 and his "5'9" claim is ridiculous. Don't agree, if you really look at him he has the body frame of a guy nearer 5 ft 8, regardless of footwear. I suspect Sigourney may have been taller than a flat 5'11". Perhaps more like 181 cm, possibly even 5'11.5". I think dishonest is the wrong word for rounding as well because it implies some intention to deceive, but many just really don't think the fraction matters. If anything, it's a bit more honest for somebody who is a solid 5'10 1/2" to claim to be 5'11" as they'll probably measure up over 5'11" at some point during the day. Will they measure up at 5'10", however? No, they will not. @Otis Most people don't bother with fractions. It's actually just as dishonest for somebody who is 5'10 1/2" to claim to be 5'10" as it is for them to claim to be 5'11", despite the fact that fewer people will call somebody on it (as opposed to somebody who rounds up). Back when I thought that '6'1 1/2"' sounded lame, I always claimed to be 6'2". Now I always refer to myself as being 6'1 1/2". He doesn't look short from a foot away. At 5' 8" or 5' 7 3/4" if you want with posture he looked hardly "short" to me almost 25 years ago. Normal footwear. Picture Anonymous 26/August/17=Tom Skerritt is listed 5"9.5' by the picture next to Rob and estimation of peak 5"11' in this site,Tom Cruise is closer to the camera. He's not as short as 5'7. Probably about 5'7.5! The meme of Tom cruise being short came from the precise fact that he isn't really that short. If he were a sub5'7 man, there would be no need whatsoever to try to prove he's short or belittle him. Guys like Bono, Al Pacino, Zac Efron, James Dean and a few others; everyone knows their short and no one cares. Tom Cruise is a guy who can look 5'11 on TV and then you see him getting dwarfed by his leggy wives. If Tom appeared shorter in film I'm certain no one would care about his height. The fact that he goes from 5'11 to 5'6 in the eyes of the public creates the intrigue. Hey Rob, if Cruise is a weak 5'8 (172cm) then why is he listed as 5'7 (170cm)? He isn't short at all if he's really 172 cm. That's exactly average for a man in Los Angeles. Rob,why do people round their heights so much, I notice even doctors do it. I was measured at 5'11 but I am 5'10 and a half. Is the world just full of people that exaggerate about their real height?? Anonymos, let's take this to the general page before trolls infest this. Except Rob is talking about the average of the male population, he isn't talking about one small group as that would be a totally different discussion. You can't just say white guys between 18-40 are 5'10" and try to pass that off as some kind of average for the population in the UK. 5'9" is average there so he is right in that people say 5'7" are short while on the other end of the spectrum you have people even saying 6' is average. Tom for instance is called short and even ridiculed by the media while he is almost 5'8" which for his generation is just lower average. I believe in the 5 foot 7 myth for Tom. Editor Rob: I think under 5ft 8 towards 5ft 7-7.5 is the lower end and probably upper end of short in the UK. If non white males and elderly were removed from those statistics, the average median would be 5'10 for sure, so average is closer to 5'11 than 5'7 these days. 1 inch above average doesn't stand out from the crowd much, but with boots/stealth shoes, it's okay, but without them, I'd choose 6'2 over 5'11 anyday. Well, if it's any consolation, I'm sure Sly appreciated you giving him your 3 mm for his peak height. Tom must like the extra mm as well, but he still won't tell you how tall he is if you ask! Rob, here you talk about the "upper range of average"
Can you please shed light on what the inverse would be? I.e. "lower range of average"
Where does this start for white men in USA? @Rob: Yeah, it shouldn't take most long to figure out you list people in height and inches and then show the cm equivalent for it. I'm sure Russell Crowe would appreciate the change. As I told Rob when I first noticed it on the Mel Gibson page, I like the change a lot. It's especially useful for listings that wind up between such as when someone was say 5'7.5" and would see a 171 cm next to their name instead of 171.5 or 5'9.5" and saw a 177 next to their name instead of 176.5. It could be hard to tell if posters meant when they'd say 171 or 177 in those instances. Incidentally, I've had Tom at 171.5 cm for a while now myself. Editor Rob: the actual feet/inches don't change, just a difference in the centimetres. Hey Rob why now various height aren't rounded? For example 5'7.75" before 172 cm and now 172,1 cm or 5'8" before 173 cm and now are 172,7 cm. Is it for the conversion from feet to centimeters or to be more precise? Editor Rob: it helps to match up with how the average vote is being displayed (1 decimal place for metric). @Pierre: Rob saw Stewart in person around the time Stewart was said and Rob guessed him only about 5'8" while people often remark Katie is tall. I've heard her guessed as tall as 5'10". She's obviously not that tall, but anything from 174-175 cm range is fair, imo. I don't really think Rob will be off on a listing by a full inch. @Slim 182 cm: I wouldn't argue below 171 either, but he could be 171 since Lewis Hamilton measured that height and I wouldn't guess Cruise was taller than Hamilton. In fact, seeing Cruise with Hamilton as well as Spielberg(171.5) and Bruckheimer(also 171) has made me believe Cruise is just about the same height as those guys. I think it's best to put the most weight into comparisons between people of similar height. I wouldn't say Tom is closer to 5'8" than 5'7" because he really doesn't usually look that much taller than 5'8" even with lifts, perhaps 5'8.5". I wouldn't argue below 171. He was edged out by Johnny Depp despite his lifts pushing him up on his toes. @Pierre: Stewart is no taller than 5'8" these days while Katie looks at least 5'8.5" to me so I'd put money on her being taller. @Rising=For me Katie is at the best of the best the same height as Patrick Stewart,very probably a little under. There's no way of knowing if you're in the same part of your stride. Mid-stride pics are simply bad for height comparisons and the example I used was even indoors. If you insist on this, I can literally keep going with mid-stride pics. Rob said the same when the pic of Pitt looking much shorter than Edward Norton was posted and I didn't even realize they were walking until Rob said that! 5'7" flat guy is still 5'7". @Pierre: Well that's your problem then as that will lead to inaccurate estimates if you really think stills taken mid-stride can tell you someone's height. Stallone and Russell weren't power walking to the shower in Tango and Cash. Please explain to me why Stallone looks 2 inches taller in the first still and Russell is at least as tall, arguably taller in the 2nd: Click Here Those were taken about a second apart. You go up and down as you walk, it's not complicated. You're not the first to make that mistake, I admitted I did in the past, but you seem to have trouble admitting your mistakes. As for Cruise, definitely 5'7.5", imo. He can easily look 5'8"-5'8.5" with thicker footwear or even a weak 5'9" with lifts and posture. He can reach 177 cm range in 6 cm type elevator boots. Rob, I'm a fan of Tom Cruise but you should admit he can be 5'7.75" (172 cm) after he woke up, 5'7.5" (171 cm) during the day and 5'7" (170-170,5 cm) in the evening. I add that He has a stocky upper body, do you think that caused him appear on the 5'6"-5'7"? Editor Rob: various factors can make people seem tall/short in photos. Cruise doesn't seem to me like how a 5ft 6 guy would look. @Johan - Yep best bet for Tom is in that 171 cm range. @Rising=I don't agree with you sorry but they are around the same distance to the camera,the picture is very clear, the angle is good even if they walk they are in the same step and this is not a power walk wich could give them a significative difference of height.And they are very close one of the other one then i think your arguments are very questionable. Don't see the big deal with Holmes and Stewart she has 0.5 inch slip ons and he has an inch shoe which we see from the second pic. She is still taller than him with 0.5 inch less shoe but its hard to judge as they are in mid stride and the pavement could have a slope, it sure looks like it. Still puts Katie at min 5'8.5" and she isn't a full inch over Tom in some of those pics most I have seen in the past is 1.5 inch between them in sneakers. Just confirms for me that Tom is 5'7" + . I would say its a toss up between 5'7.5"-5'7.75". I don't see 5'7" flat or 5'8" range unless he has thicker footwear. With lifts he can pass for a legit 5'9" guy - reaching 5'10" in footwear. @Pierre: I stand corrected on the shoes. That's a pretty tiny heel, but I would have guessed those shoes 1/4" before seeing it, so perhaps 1 cm, possibly a little more depending on the insole. But my statement on walking pics needs no amendment. People go up and down as they walk and if you take stills, the heights can vary at least 2 inches. This was proven years ago on the Stallone page when the clip from Tango and Cash of Stallone and Kurt Russell walking to the shower was posted. I took stills where Stallone looked a couple inches taller while another poster took stills where Kurt could even look a bit taller. That's too big a variation, and keep in mind, this was indoors, while your photos are outdoors. You can only get a general idea of how tall someone is from that, but you can't determine whether someone is 174 or 175 from mid-stride photos. Case in point: Click Here Click Here Now we know Katie is taller than that next to Tom since they look about the same height there with similar shoes. We can save a lot of time if we take all mid-stride photos with a grain of salt. I take that back, I was proved tom isn't 5'8. He's lucky to have such a listing. Even if it was 2 inches, that would make Tom 5'7.25"-5'7.5" when we consider Katie's sandals, but I don't see 2 inches there personally. I don't get what that Stewart is supposed to show. You can't judge height from still photos taken while two people are walking. Besides, even if we were to foolishly ignore this, she looks as tall as him with significantly less footwear as she just has 1/4" type flats while Stewart has at least 2 cm shoes. Rob are celeb estimations based on an evening height measurement or a midday measurement? Tom seemed just slightly shorter than 5'8" Sean Penn in Taps - roughly half an inch - any opinions on this? I think it's probably the best of Ton's early films to judge his height from considering how well known Penn is. I think it's become increasingly obvious Tom isn't quite 5'8", but he's not really far from it. He's only a bit shorter than 5'8" guys and to a typical person would probably look the same height standing with one. Btw, here's Tom with Simon Pegg, who looks to only have 1.5 cm shoes: Click Here They're almost identical, but Tom seems to edge him out if anything, albeit with better posture. But I noticed the angle of Tom's shoe and the back and thought there was a chance of an elevator shoe and then found this sitting photo, which seems to confirm my suspicions: Click Here My guess is Tom was the same height or a hair taller with 3.5 cm more footwear. They're so close in height in that footwear, either can look a hair taller depending on who the camera favors. I would guess Pegg standing a fraction taller as he has a tendency to hold looser posture and bend his knees a bit. I do think Tom has lifts in his boots, but then he's looking at least 5'8.5" if Pegg is the 5'8.75" Rob lists him. Of course, Pegg emphatically claims 5'10"! This would be believable if Cruise were actually 5'9", but these comparisons show Tom can pass for a strong 5'8" in a typical elevator and a weak 5'9" in bigger boots. As for Tom's height claim, I have wondered if he's lowered his claim, but the fact that you can't even ask him doesn't seem like it to me. It seems that Tom doesn't want to put a figure on his height publicly anymore. Perhaps he thinks it's better to just appear taller than people think he is. I can't blame him. If Tom were to come out and claim 5'9" today, it'd receive a ton of scrutiny from rags like the Daily Mail. I had actually thought Mark Wahlberg would have lowered that ridiculous 5'10" claim from 1995 that nobody could possibly believe and would go with a more reasonable 5'9" or even 5'8.5", but much to my surprise, Marky Mark repeated the 5'10" claim a few years ago! rob, could tom cruise drop to 171cm at ninght in his peak? Thanks, Pete....err, Parker(Spiderman?). That is exactly the set of pics I was referring to. But I'm sure Cruise had lifts implanted beneath the soles of his feet, cuz he HAS to be 5'7" or under, right? Yes, good find, Pete. I don't know if Katie's sandals add 1/4" or 1/2" since I don't own any sandals, but it's certainly more than Tom's bare feet, unless, of course, Tom's feet are actually hi-tech elevator shoes! If we assume Katie is between her 5'8" and 5'9" claims and the sandals take her to 5'9" then the shortest Tom looks to me would be a very solid 5'7", but I think he looks more 5'7.5". Now if Katie is 5'9" in bare feet as Rob lists her then of course you can raise that a bit. You can use the big guy's head in the background as a reference. Tom's head is above his nose and below his eyes, but closer to his eyes.Katie's head is at the top of his eyebrows, possibly just above. The front shots show you roughly how much extra hair they have, at least insofar as we can guess this without actually flattening their hair under a stadiometer. Only if we lower Katie an inch from Rob's listing to 5'8" could Tom look less than 5'7". Hi Rob, you saw Cruise-Holmes photos? If in those photos Katie Holmes is 176 cm then Tom Cruise is between 171-172 cm. Again if you look Cruise's shoes are slightly higher than DiCaprio, and you can also notice that the shoes has lifts inside of 2-3 cm. If Cruise is a good 176-177 cm here then barefoot he could be 171-172 cm. Rob what do you think of a 5'7.5"-5'7.75", at most, Cruise? Rob, If in those photos Katie Holmes is 176 cm then Tom Cruise is 1.5"-2" shorter and between 171-172 cm. What do you think of a 5'7.5"-5'7.75" Cruise? Rob, do you think that I'd be about an inch taller than Tom? Editor Rob: if you met him at an event in normal 2cm range shoes, you might be surprised...I'm sure he'd look near your height with some of the boot/shoes he has worn recently. Tom barefoot next to 5'9 listed Katie in a half inch sandal. 1/4" is no insignificant I can't really dispute it, but at the same time, there's no evidence of it either. He probably always was 5'7.5". He could look either 171 or 172. I know Dmeyer agreed that Tom got 2.3"-2.5" from his boots and lifts at Bruckheimer's Hollywood walk of fame ceremony 4 years ago, but Tom only looked 1"-1.5" taller and if Bruckheimer is 171 cm and his dress shoes were 1" then that would make Tom 176-177 cm with booots and big lifts. Subtract even the low end of 2.3" from the max 5'9.75" that would make him just scraping 5'7.5". Cruise was also half an inch to an inch shorter than Johnny Depp who had over half an inch less footwear with normal 1.7" cowboy boots, but I really see Depp more 174 than 175 cm, which would also put Cruise no more than 171.5 cm. Cruise already losing height 4 years ago becomes a bit less likely, imo. If you look at Tom with Leo last year, he could look 5'8.75"-5'9" with 2" elevators and better posture. Tom has looked taller than ever since about 2010 while in the early 2000s, he was no taller than 5'7.5" Spielberg. Look at the Tropic Thunder premiere I posted below as well, he looks 173 range in 2 cm sneakers sneakers. Or in this All The Right Moves promo pic, he actually looks more a 5'7" guy with 5'3" Lea Thompson: Click Here Funny enough, Tom's character claimed 5'10" in that movie! I always thought Tom was a good actor, but if he can play a 5'10" guy then he's a better actor than I thought! Speaking of his early movies. With a footwear advantage, he looked more a 5'7" guy with 5'6" Shelley Long in flats in Losin' It. Like I said, it's such a minimal amount, I can't really dispute it, but at the same time, there's no actual evidence of it either so I wouldn't assume a fit guy like Tom who always has outstanding posture would lose anything while still relatively young. Sly Stallone, who is similar in that regard, made until at least his 60s, probably his mid to late 60s before losing anything. Staying fit with good posture can take you to a much older age than Tom without losing anything, but when we're talking about a 1/4", Tom's shoes vary more than that on a regular basis, as do many others so there's a reason Rob doesn't give peak heights until it's a half inch loss. ".....at 5 feet 9 inches" was almost three decades ago. He may very well advertise himself as 5'8" today(if asked, which I heard is against the law!). I still say right between 5'7" and 5'8" - no discernible difference between Cruise and Spielberg, Lewis Hamilton and Jerry Bruckheimer. Remember a real 5'8.5"-5'8.75" guy Jason Statham had at least an inch on him. But for the Cruise is under 5'7" crowd, since I already posted two videos of Tom and Mario Lopez, I'll post a few stills for convenience. If Tom had lifts there, he's doing a pretty good job hiding them and looks as tall or taller than Mario! Same thing, pretty normal looking shoes, but while Tom is shorter this time, it's not by much - an inch tops - as it's difficult to tell who is taller at certain points in the video when Mario puts his head down. So how tall would the Cruise is under 5'7" crowd say Mario is? For reference, Mario has consistently claimed to be 5'11". Now he's nowhere near that tall and like Cruise, he's also looked shorter than Statham, so I've personally concluded he's 5'8.5" and Rob lists him 5'9". He can't be far from that range yet Cruise is similar in height without obvious lifts. If Cruise is under 5'7" then what is Mario? Under 5'8"? @MJKoP and Parker: Yeah, that's the photo I was talking about. I know the date and location(Australia, February 2006), but can't seem to find it either. You guys looking for these photos? Rob is it acceptable for Cruise to claim 5"8 for convience I feel he is closer to 5"8 than 5"7? Editor Rob: I think he should claim 5ft 8. @MJKoP and Parker: Yeah, that's the photo I was talking about. I know the date and location(Australia, February 2006), but can't seem to find it either. If she's 5'9" then Tom at under 5'7" would look roughly 2.5" shorter considering her sandal. Even if she's 5'8.5", it'd still be about a 2" difference. Of course, I'd be a hypocrite to put too much stock into one photo, but if you follow the same logic some do on the Brad Pitt page, then that one pic proves Tom is taller than 5'7". @Rob: Yeah, I'd say around Knight and Day in 2010 was when Tom's footwear seemed to grow. Diaz at 5'8" would top 5'11" in those heels and perhaps reach 181 cm or come close as they seem at least 8 cm to me and she looks about 4 cm taller than Cruise in the first pic to me and more like 2 cm range in the 2nd and 3rd pics. I'd estimate the difference around 3 cm from the video, but it can look anywhere from maybe an inch all the way to 4 cm. This seems to safely put Tom at 177 range in those boots, which I'd say are about 6 cm or 2.3"-2.5" range. It's quite possible he even reaches a full 5'10" in them. So 5'7.5" looks the safest estimate barefoot there, but the 172 cm is obviously possible if those boots are only 2.3" and if he's reaching a full 5'10". Holding his own with a 5'8" woman in big heels shows he's not 5'6" range as he'd be lucky to hit 5'9" in those boots. In fact, the press remarked on how conspicuously tall Tom looked at that event. The other period Tom's footwear was quite large was around the time he was married to Nicole Kidman, particularly towards the end when he did MI 2. Cruise did it to himself with all the hot tall women he has dated lol. If he had dated average sized women the 5'6 and below nonsense wouldn't be happening. People see all the pictures with him being towered by tall women in heels and make assumptions based on average sized women. You're right I focused on the difference between DiCaprio and Hardy and I didn't notice that detail. If you look, Cruise's shoes are slightly higher than DiCaprio, and you can also notice that the shoes has lifts inside of 2-3 cm. If Cruise is a good 176-177 cm here then barefoot he could be 170-172 cm. @Rob? Still open for a 5'7"-5'7.5" Cruise? ... But alas he is loaded and I am not!